The summer months of 1776 witnessed the most consequential events in the story of our country’s founding. While the thirteen colonies came together and agreed to secede from the British Empire, the British were dispatching the largest armada ever to cross the Atlantic to crush the rebellion in the cradle. The Continental Congress and the Continental Army were forced to make decisions on the run, improvising as history congealed around them. In a brilliant and seamless narrative, Ellis meticulously examines the most influential figures in this propitious moment, including George Washington, John Adams, Thomas Jefferson, Benjamin Franklin, and Britain’s Admiral Lord Richard and General William Howe. He weaves together the political and military experiences as two sides of a single story, and shows how events on one front influenced outcomes on the other. 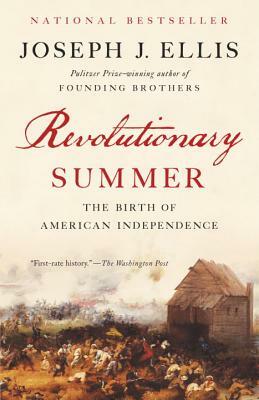 Joseph Ellis is the Pulitzer Prize-winning author of Founding Brothers. His portrait of Thomas Jefferson, American Sphinx, won the National Book Award. He is the Ford Foundation Professor of History Emeritus at Mount Holyoke College. He lives in Amherst, Massachusetts, with his wife and their youngest son.